A Doctors Without Borders Staffer Shares Impressions From The Front Lines Of The Fight Against Ebola : Goats and Soda Leah Feldman was on the Doctors Without Borders team in the 2014 outbreak. Now she's helping fight the virus in the Democratic Republic of the Congo — and literally sweating in her boots. 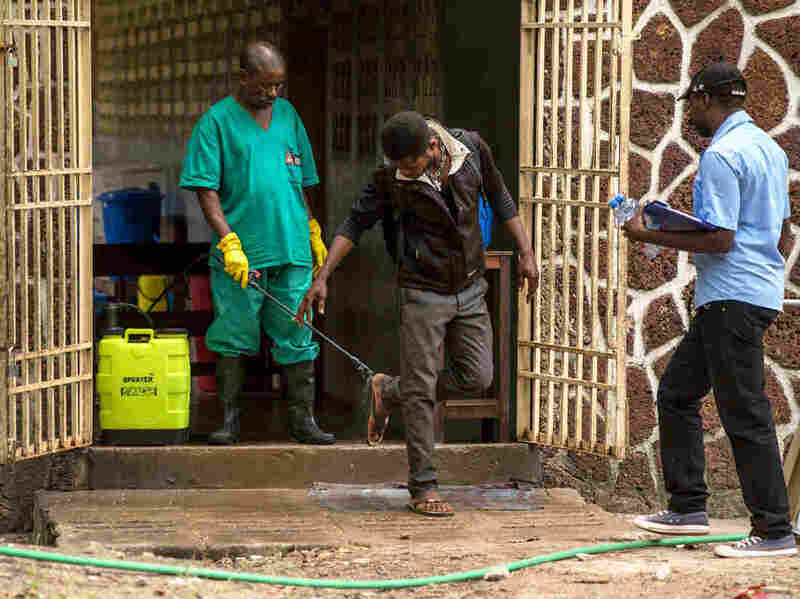 A worker disinfects shoes outside the Ebola security zone at a hospital in Mbandaka in the Democratic Republic of the Congo. So Feldman was drafted into the war against the virus. She is now medical coordinator for the Doctors Without Borders effort in Mbandaka, a city of more than a million, on the banks of the Congo River, where the virus has recently spread. As it did in West Africa, the medical charity is playing a key role in stopping the epidemic. The toll so far: 35 confirmed cases, 19 additional suspected cases and 25 deaths. Feldman not only knows logistics, she knows what it's like to put on protective gear to treat patients: "It's quite hot. In full PPE [personal protective equipment] I think you can easily sweat two liters into your boots." She spoke with NPR about the campaign to stop Ebola. This interview has been edited for length and clarity. I don't even know if I can tell you what I do on a daily basis. I am the medical focal point for the project, which means all the medical information is centralized with me. I work with the Ebola treatment center as well as our outreach team and epidemiologist and our lab people. We start at about 6 a.m. and finish sometimes around 11 p.m. I don't how many [hours] that is. It's bad not even being able to count any more. Sometimes we finish earlier. How does this outbreak compare with the Ebola outbreak in Guinea and its neighbors? Obviously the size is different. It's much smaller. But the biggest difference is that there's quite a massive immediate response from the Ministry of Health — and [that kind of local response] was quite delayed during the epidemic of 2014 to 2015. And there are so many groups on the ground, both from the Ministry of Health and international actors. Last week the media reported that two Ebola patients had escaped from the hospital where they were being treated. Yes, there were two patients who did escape. Escape is not really the proper word. It's a hospital not a prison. It's not like we're going to lock the doors. We can't force people to stay. How do you convey the message that home care is not the right kind of care for Ebola? This is a lot of work by our health promotion team to explain what the disease is and why a person should stay in the treatment center for their own health and the health of their family. Those patients were in a hospital. Is that still where suspected Ebola patients are sent? Our treatment center is open since Sunday afternoon. We do everything we can to make sure the conditions are appropriate for patients, that there are beds and food three times a day, visiting zones, things like that. What does the center look like? It's our standard set-up for an Ebola treatment center. Tents are the most rapid thing we can put up. They are very large, 47-square-meter tents, divided into different zones, with toilets, showers, orange fencing. It's a very nice structure. Do you run a test to see if someone who's sick actually has Ebola before admitting them to the center? We don't wait for test results. We start treating [suspected Ebola] patients as soon as they enter the treatment center. We give anti-malaria treatment, antibiotics and then symptomatic treatment as well as hydration, fever and nausea management. With Ebola you give the maximum you can in terms of supportive care. If the person gets a negative result [from the lab test] and is not an Ebola case and they're still sick, we send them to the hospital for proper care. I sometimes go into the isolation center [where patients are] and do blood samples because not everyone is experienced in taking blood samples when you're in full PPE. Well, you try to breathe because it's very hot. And make sure you don't have fog on your glasses. The taking of the sample is exactly the same as for any nurse who does a blood sample anywhere — but be very, very careful with the needle. Make sure you have all your materials with you before start, then just take a normal blood sample. What's different is the way we send it to the lab. First when we take the blood [container] and decontaminate it — spray it with chlorine, then put it in another container sprayed with chlorine, then put it in a third container that's sprayed before it goes to the lab. When it gets to the lab, the lab technician is in the low-risk zone, sitting behind plexiglass. And in the plexiglass are two gloves that go into high-risk zone. So the lab tech's hands go into the gloves and they're manipulating [the blood sample] in the high-risk zone. It takes me not even two minutes to walk from where we've taken blood samples to the lab to process [the samples]. We deactivate the virus. Then it can go into the machine [to see if it is Ebola]. The machine itself takes about an hour and 40 minutes. The whole process can be from two to three hours. How do you deactivate the virus? That is a technical laboratory question that I do now know the answer to. But it is deactivated. Burial practices were an issue in previous outbreaks — touching and washing the dead, which was part of the reason that virus spread. As in Guinea, some of the rituals in the Democratic Republic of the Congo for treating a dead body is that family members will all wash it. There's a lot of work by the health promotion team to explain why they can't wash the body. How are the bodies buried? We have to make sure there are safe and secure and dignified burials. This is something the Red Cross normally does. We are working in collaboration with them. Normally during an epidemic we consider that all deaths in the community need a safe and secure burial unless it's extremely clear [that it was not Ebola]. The safe and secure burial in the context of Ebola means decontamination of the body, putting the body in a body bag, do a sample, an oral swab [to test for Ebola if the virus has not been confirmed]. The body bag is put into a wooden coffin for the family, and the Red Cross takes the coffin to the cemetery and insures that it's buried properly. It's very important to have the coffin. Have there been recent burials? There were two community deaths yesterday. We don't know if they were positive or negative for Ebola. Because the swab results have not come back yet? Yes. But we had the safe and secure burial. How do the health workers cope with the stress? We have an amazing team. You see many of the people that you worked with three years ago [in the West African outbreak] and haven't seen since. It's as though nothing really changed. We're back together, we know each other and know what we're doing, we're all working like crazy. We try to rest as much as we can, try to eat when there's food to eat, read when there's time. We do short [in-country] assignments [for emergency outbreak responses like this] because it's exhausting. [An assignment is] several weeks typically. It's never more than six weeks because it is tiring work. And the thing is you can't make mistakes in Ebola. You have to take care of yourselves, you have to be in good shape physically and mentally be at the top of your game, or else you make mistakes. So does that mean the pace of work is frenetic? We say it's an emergency but we never run during Ebola. Everything has to be slow and planned or we make errors. We are able to hopefully contain what could have been something bigger — hopefully. Any predictions about the extent of this outbreak? It's impossible to tell. There is a real concern because we are in an urban setting where the population is quite mobile. All the systems [to contain the outbreak] are being put in place — surveillance, outreach team. But I don't have a crystal ball. I think it's too early to have a frame of mind. We're still building the epidemiological picture trying to understand the chain of transmission and how the virus is passing. Do you know about the first case for this outbreak? The whole story of how this started is not completely clear yet. Most times the first case is someone who handled bush meat — bat or monkey – that was infected. That person dies and because of rituals and customs people are washing the body, and those people get sick and they get other people sick. Typically that's how it's spread. Can I ask where you're from? I am from Howard County, Maryland. There were disastrous floods on Sunday in the town of Ellicott City in Howard County. I have no idea what's happening in the world outside of Congo. Can I ask your age? I am 30 years old. I celebrated my birthday in the air while I was on the plane coming here [for the cholera project]. So you've had a crash entry into your 30s. Exactly. We say, "baptized by fire." An earlier version of this story incorrectly called Leah Feldman a doctor. She is a trauma nurse. The story also said that two men with Ebola who left a hospital eventually returned to the hospital. One did return; the other died at home.